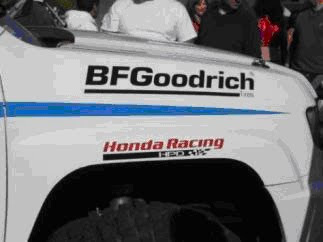 We’d brought some of the new "Honda Racing/HPD" stickers with us with the intent of decaling the race truck. After gaining permission to do so, I began to question the wisdom of "stickering" the truck in front of everyone. Sure enough, as soon as I began to apply the first decal, the kids were there. Unfortunately, they left disappointed, as we had only enough for the race truck and our support vehicle. But the result was worth it; HPD now had a presence on the Baja! Sporting the Honda Racing HPD sticker. 11.19.09 American Honda raided its stockroom and came up with several boxes of Honda championship hats, circa 1998! While these would be our giveaways, I wondered if eBay might be a better place for them, as these were now, no doubt, collector’s items! The team decided that the thing to do would be to wait until the truck was moving along in the tech line and then, with a couple of guys sitting in the bed of the truck, to break out the hats – and so they did. Pandemonium broke out almost immediately! The truck disappeared amongst a complete sea of people, all scrabbling for a hat or two. Tech inspection itself was a fairly basic affair; most of the entries were already known to the inspection people, so they were primarily concerned with checking seat belts, helmets and race suits. Needless to say, no issues arose with the Ridgeline. We took the opportunity to speak directly with technical representatives from SCORE, the sanctioning body, about an increased Honda presence; perhaps offering an alternative engine package or even a new class alternative engine. This was met with a lot of general enthusiasm and needs further follow-up to see what is truly possible. The Race begins. . .with motorcycles. 11.20.09 The race started officially at 6:30 a.m., as the first of the motorcycles got underway; the four-wheeled vehicles followed off approximately three hours later, for reasons of safety and to try to give a decent break between the two groups. Despite knowing that a long day was in store for us, I was up at 6:30 a.m. to see the bikes leave. It seemed a very relaxed affair, but I am sure that the riders’ hearts were pounding! I can’t imagine what it would be like for these guys (and girls); 670-plus miles is a long way to ride on a bike, even if you are sharing with another rider or two. As for the guys going solo…. Waiting for the start of the bikes. An interesting show unfolded in front of me. Just past the start, I noticed a rider standing without a bike, all suited up and ready to ride. The reason became quickly apparent: the "start" rider left the starting line, rode about 50 meters, and then pulled up alongside the waiting rider. A quick rider change followed, and the bike and new rider left. I can only surmise that the guy riding off from the start was the one that paid the most money or owned the bike, and he wanted the official start photo shot! Despite the fact that the riders were now faced with at least 12 or so hours of riding, this didn’t mean that they took Turn One easily! But it was 6:30 a.m., the "track" was very cold and they were all on new tires, so you can imagine how much grip was available. Some were tentative and others … well … plain crazy! But the fans loved it! Showboating: 2-wheeler on 1 wheel, ATV about to go there, too! And if you thought the bikes were going for it, you should have seen the ATV riders! Now, having an ATV at home, I know how hard (and heavy) these things are to ride, so I cannot even begin to imagine what it would be like to ride something like that for the duration of the race. The first ATV past me caught me by surprise; it came so close to the barrier I could have reached out and touched the rider. But they provided a lot of entertainment for the fans, who just loved them! Ridgeline takes STOCK MINI lead + Honda running 1-2 in motorcycles. The Toyota was the new-model 4Runner with what appeared to be heavy support from TRD, and legendary Baja competitor Ivan Stewart slated to drive. The Ridgeline left the line shortly after midday and at 12:30 p.m., we received a text to say that it was passing RM15. John and Gary in Chase 2 had a laptop connected to the Internet and were tracking the progress of the Honda Ridgeline "779" live via GPS. They’d continue to provide text updates throughout the race. At RM 35, a gap of one minute, 30 seconds existed between the H3 Hummer and 779; with the Toyota about 3 minutes behind. At RM 50, the 779 radioed in to say all was well. Driving down the highway we spotted a Class 12 car pulled over on the side of the road; it was one of the VW-powered buggies that Matt used to work on, and he knew the owner / driver. Ignition problems had been diagnosed, and we watched as they tried to make repairs. After a while, we realized that the repairs were not fixing the problem, as the engine was still misfiring. Out came the trusty ty-rap to determine which cylinder was not firing. A damaged homemade plug lead was discovered; once fixed, the car fired and ran cleanly. We heard from the race truck that it had cleared BFG1*; all was well and only minutes stationary – a good stop. At 15:03, the Toyota cleared BFG1, now 16:35 behind. 779 is averaging 30.2 miles per hour over the course. *BFG1 = BF Goodrich Pit 1. BFG provides a pit service to all those entrants running their tires. For a small amount of money (approximately $600), the BFG folks ordered and provided fuel at each stop, filled the car, changed the wheels and tires, etc. and allowed teams to carry out repairs in their well-lit area. They also provided a valuable radio relay service. More on that later. We discovered the advantage of having an extra chase truck, as mountains and valleys started to break up the terrain and maintaining communications became harder. We leapfrogged from one truck to the next, relaying the signal until the right destination was reached. This proved to be very valuable. 3:27 p.m. … RM105 – …"Everything good." Tacos #2 came up at Val de Trinidad – a late lunch. Three tacos each, and a couple of ‘Honda Racing’ stickers now adorn another taco restaurant…. We pulled into the race course near V de T to see the front-running bikes go through; the Honda Pit was set up and waiting. We discovered that the locals were becoming entrepreneurial and were now charging $5 for entry to the race course. We saw the #3 bike come through, this was the second Honda, and Hondas were now running first and third, with the factory Kawasaki in second place. The speed of the top riders was very impressive! At RM134, 779 had built up a 20-mile lead. 11.20.09 At RM134, 779 had built up a 20-mile lead. Then, somewhere around RM 140, we heard that a bolt has been lost from the front-right lower control arm. Fortunately, a spare was available, and the delay was not too costly. At RM154, the Ridgeline’s lead had been reduced to 16 miles. We pulled into BFG2; it was now nighttime (approximately 8:30 p.m.), and the temperature was dropping quickly. The dust at this point was very heavy, and the crowds of people likewise. Despite the fact that Trophy Trucks and Class 1 buggies were approaching at very high speeds, the crowds were right on the edge of the race track. 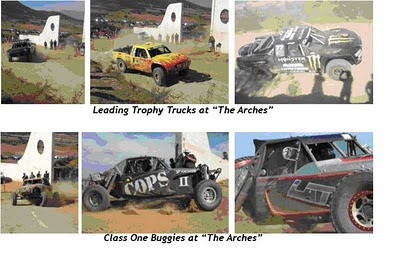 We witnessed Two Trophy trucks racing each other; the chasing one ramming the leader from behind … “Hey, we are here! Let us through!" 779 pulled in to BFG2 for a quick stop to replace a punctured tire, refuel and tighten suspension bolts, and the Ridgeline was on its way. Both driver and co-driver pulled on more clothing and grabbed some food. Stop time was 4 minutes, 20 seconds. The Toyota was now 27:30 behind and made a leisurely stop as we watched. We stopped on the side of the road to watch some of the cars come through the valley below us; fortunately, someone had lit a fire and the embers were still glowing. We coaxed it back to life to get some warmth as we watched. It is definitely cold now! Our next destination was the west side of the Baja peninsula; this meant we had to head back through Ensenada, so we took the opportunity to stop back at the hotel (at 12:15am!). It’s amazing what a toothbrush can do to make you feel slightly cleaner! 12.21.09 RM321 – 779 had a 53-mile lead over the Toyota. An all-night 7-Eleven provided coffee, and shortly afterwards, we found a taco stall for Tacos #3. By all accounts, these were the best so far. Our overnight destination was BFG5 – basically, a field in the middle of nowhere, for the final major service stop (barring problems). We arrived at 2:30 a.m. and, despite being really cold, we all crashed out in the truck. I discovered that it is possible to sleep on half the back seat of a Ridgeline, while using Matt’s crash helmet as a pillow. We were up again before the sun rose and sought out news of the Ridgeline; unfortunately, it wasn’t good. Apparently, a variety of suspension issues had arisen during the night, but more concerning was the fact that the chase cars that had gone to the rescue were also stuck on the course with damage. The gap to both pursuing trucks had also closed dramatically … 20 and 36 minutes to the Toyota and Hummer, respectively.More worrying was that we had lost touch with the race truck and no one was able to raise it. Due to the problems over chase cars getting stuck, the scheduled rendezvous back at V de T was in jeopardy, and the truck would have to fend for itself until it reached BFG5, where Chase 3 and Chase 4 were waiting. We would catch snippets of radio transmissions from the truck, but nothing could be communicated back. Eventually, we asked BFG Radio Relay to try to contact the truck, but they, too, failed. We could hear the truck calling for a replacement co-driver, as after nearly 22 hours in the passenger seat, Vlad had had enough. 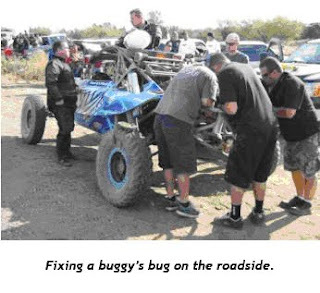 Scott was due to replace him, but Chase 1 was nowhere to be seen; meanwhile, Matt had "foolishly" brought his race suit and helmet and was instructed to get suited up, just in case – fortunately, he was familiar with the course ahead from a previous running of the Baja event. In the end, his driving services proved not to be necessary, as Chase 3 made it in time. 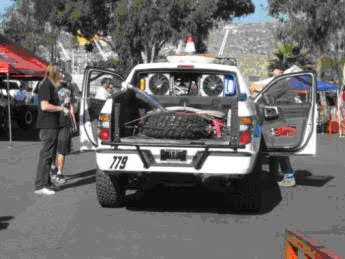 11.21.09 As we raced toward the beach, we received the radio call we had been dreading, the race truck had lost all forward gears and only had reverse. Gavin was able to gain some momentum under very low throttle applications going forward, but as soon as a hill presented itself, he had to spin round and tackle the hill going backwards. We called to them that we would attempt to meet them up on the course; fortunately for us, we caught them not too far off the main road, since we were traveling the race course in the wrong direction! It was a sorry sight, seeing the truck having to reverse up the race track to meet us…. After an initial investigation, and discussions with John and Gary, we concluded that the main driver clutch in the automatic transmission had failed. And at RM565, 779 retired from the 2009 Baja 1000. A sad procession followed, with Chase 4 towing the race truck off the course and back toward the main road, then on toward Santo Tomas and eventually Ensenada. En route back to Ensenada, the call came over the radio to stop, as food and extra layers of clothing were needed. Note that the race truck has no protective glass, so the outside air just blasts straight in on the occupants. This would be Taco Stop #4 and yet again, they were wonderful; perhaps being helped by the fact that this time, they were accompanied by a beer! Everyone was tired and dirty, but in reasonable spirits, despite the disappointment of not finishing the race. We managed once again to get Honda Racing/HPD stickers in pride of place, adorning yet another Mexican establishment! But the fun wasn’t over yet… We were 25 kms from home when we saw blue lights flashing from behind. Yes, we were being pulled over by the local police. Apparently, you are not permitted to tow cars in Mexico; they have to be on a trailer. Hmmm, you know, I had noticed all the locals moving their broken-down cars around on trailers and wondered why….NOT! The police officer was not the most friendly person ever encountered and seemed quite deflated when we said, "OK, we will get one." 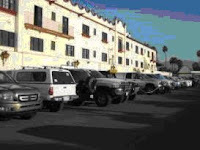 "Ensenada," we replied, as we radioed for it! With that, he stormed off and got in his car and drove up the road (no doubt, to wait a couple of miles further away, assuming we would just carry on, regardless). 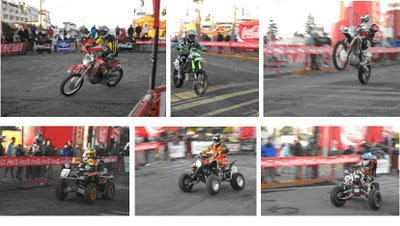 And that was Baja 1000, 2009. 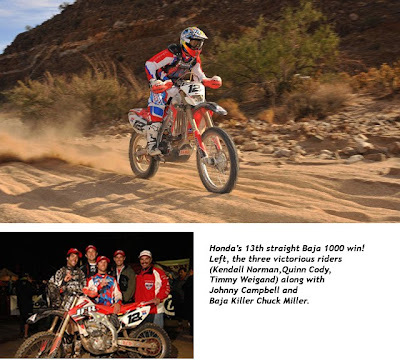 The spirit of Baja embraces many people and the number of them on or in Honda-powered vehicles is something to grab hold of. I counted at least 55 entries that carried the "H" mark. It was an amazing experience, and I, for one, am converted and will be back next year. I’ve heard that the next running will be a ‘straight’ run down to La Paz. That will be amazing, I am sure. to be continued. . .next year. 1. What is Honda's preferred engine direction in the new IndyCar specifications? What horsepower levels? We will design a V-6 engine and horsepower is difficult to say, but we are targeting a 225 mph average lap speed at Indianapolis. With the information we have been given, we will require somewhere around 575 hp. We hope to have more hp available for road-course racing, subject, of course, to IZOD IndyCar Series approval. 2. Did the IndyCar muffler contribute to the instability of cars in traffic? Any thoughts of removing it next season? We have no plans to remove it. We have not received any reports from race teams regarding any instability in traffic. Our initial testing of the muffler in 2008 showed very little change to the aerodynamic performance of the car. 3. If the fuel-mixture switch has, say, six settings, why not make #4 the max the engine can do, and then have P2P (push-to-pass) be the equivalent of #6? Anything is possible. Right now, we are in discussion with the IZOD IndyCar Series to remove the fuel-mixture switch from the car completely. 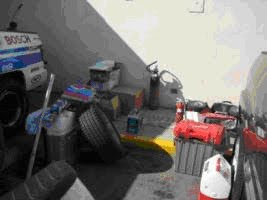 This would make the driver responsible for controlling the amount of fuel consumed with his or her right foot. If we do that, we will adjust the standard engine setting to make the P2P more effective.